I learned some very unsettling information this week. Apparently neither Giada At Home nor Nigella Kitchen are filmed in either one of their homes or kitchens! I feel so dupped. Now I would give anything to see one of these shows filmed. What do they do with the food since they are clearly NOT serving it to their families at their homes?! This does, however, make me a little less concerned about Giada's OCD issues, as her "house" is always freakishly clean. But this does nothing to explain the stupid surf boards that sit outside the translucent windows in the kitchen. Or why she is always running "upstairs" to change. And when Nigella goes late night in her bathrobe to grub on the remnants of her pies, is she actually just doing that in her studio kitchen...midday...with the lights off? 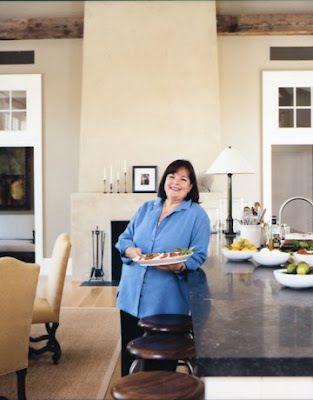 This gives me mad respsect for the Original Gansta Ina Garten. That show is straight up filmed in her house. What she lacks in wearing anything besides oversized button up shirts, she makes up for in honesty. In related news, if you want to watch the most annoying episode ever of Giada at Home, I suggest the Pasta Party. Between her pronunciations of Pasta, Ricotta, Parmesan Reggiano, and Penne, it's enough to make you want to never travel to Italy again. Or even your local Olive Garden . Paula also films in her house. Where is the love?? I don't watch her because I gain weight just observing her abuse of butter. I am a friend of your sisters and she shared this blog with me. you are freakin' hilarious. I crack up every time I read your entries! Keep it up !! !